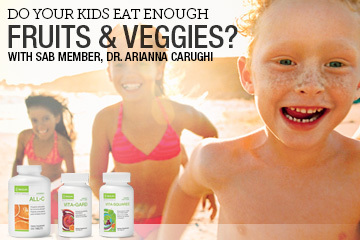 NeoLifeblog | Children's Nutrition: Do Your Kids Eat Enough Fruits & Veggies? With summer time fun in motion, and the kids out of school for vacation, keeping them healthy, happy and productive can be a lot of work! And let’s face it, raising kids and juggling life is no easy thing. According to the USDA, children ages 4-18 need between 1 to 2 cups of fruit and 1 to 3 cups of vegetables daily. The good news is that the latest health survey shows kids are eating more fruits and vegetables, but the bad news is neither of those requirements is being met! Parents can participate in many ways when it comes to influencing their children and educating them on keeping and living out a healthy lifestyle. As they grow up, kids also tend to learn their eating and nutrition habits from their primary caregivers–and in most cases, it’s their parents! Click here for more information and find out why thousands of people across North America are saying the NeoLife Web Health Talk is a half hour that changed their life! If time is money, that’s money well spent.